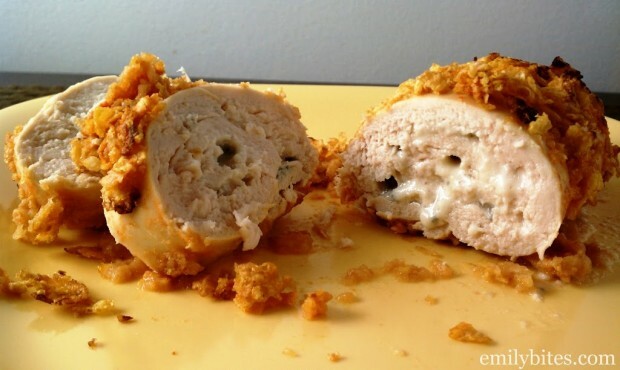 Mmm…Buffalo Chicken Roulades. This is a great weeknight recipe because though it tastes great and looks impressive, it takes less than 20 minutes of prep time to put together. You can also easily double or triple this recipe based on how many people you’re serving. I loved the corn flake coating on this and though there was obvious Buffalo flavor from the Frank’s, it wasn’t too spicy. If you prefer it hotter, you could always use the “Xtra Hot” Frank’s. Juicy chicken breast, Frank’s Red Hot and creamy blue cheese are a match made in Heaven either way. Preheat the oven to 400. Lightly mist a baking dish (I used a 9 x13 but a smaller one would work) with cooking spray and set aside. Place the chicken breasts on a cutting board and cover them with parchment paper. Using a meat mallet, pound the breasts to a ¼ inch thickness. Season breasts with salt and pepper to taste. Sprinkle a tablespoon of blue cheese evenly across the surface each breast. Starting with a short side, roll each breast up and seal shut using toothpicks. In a small bowl, mix the hot sauce and sour cream until thoroughly combined. Pour the crushed corn flakes into a shallow dish. 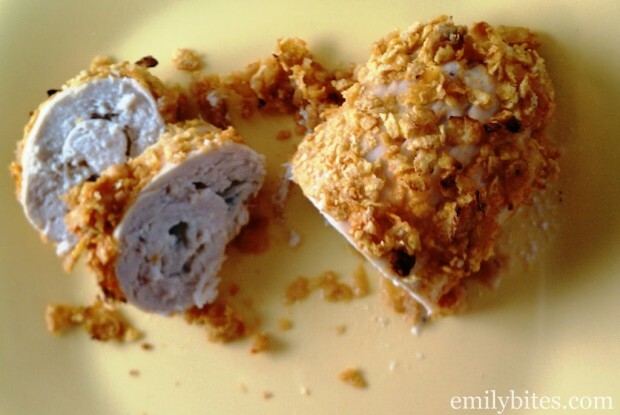 Brush the surface of each chicken roll with a liberal amount of the hot sauce mixture and then roll in the corn flakes to coat. Place the rolls seam side down in the prepared baking dish. what can i use instead of blue cheese? Any recomendations? Unless you can’t really taste it…? Of course you can taste it, that’s the point! 🙂 It’s funny because I almost put a line in there for people who don’t like blue cheese since every time I post a Buffalo chicken dish I always get a bunch of comments saying that. To me, nothing goes with Buffalo chicken like blue cheese, but I suppose you could use another type of cheese to stuff the chicken. Maybe cheddar? oooh, thanks for the recipe! Can’t wait to try it! Could you use laughing cow wedges (maybe the queso flavor) instead? Would that change the points plus value any? Megan – I don’t see why not. It shouldn’t change the P+ if you use 1-2 wedges. Awesome! I’m so excited to try this. I bet everyone on the WW 20s board would LOVE it! I cant’ tell you enough how much I enjoy your website. Its inspired me to cook again! So you call for two 6 oz pieces of chicken and then it’s only 2 servings? That seems like a hefty serving, I just wanted to make sure I read it right. Yes, it’s 2 servings and each one includes a 6 oz (raw weight) chicken breast. Enjoy! What could you make with this for a side dish? What is the points plus for 1- 6 oz breast? CHicken is usually about 1 pt per ounce so 2 is too low.